Dr Anbumani Ramadass MP presented a letter to Prime Minister Shri Narendra Modi on 10th August 2016, containing the various issues relating to Education loan. ELTF is approaching all the Parliamentarians to take up the Education Loan issues with the Government and Parliament. Recently, Shri T K Rangarajan MP took up the issues in Rajya Sabha. 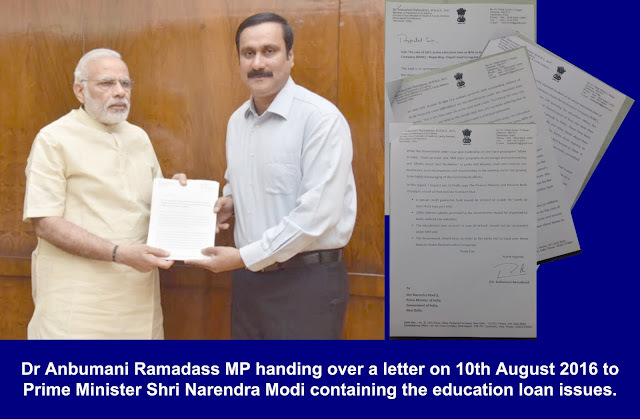 On our request, Dr Anbumani Ramadass MP met the Prime Minister Shri Narendra Modi personally on 10th August 2016 and explained to him the various problems faced by students who have availed eduction loan from banks. He also quoted the incidents of Reliance Assets Reconstruction Company harassing the students forcing them to comit suicide. Dr Anbumani personally informed ELTF that Prime Minister went through the letter line by line patiently and listened to him fully. He also promised that he would look into this matter on top priority. The text of the letter given to Prime Minister by Dr Anbumani is reproduced below. ELTF thanks Dr Anbumani Ramadass for having taken up the issue personally with the Prime Minister. Sub: The sale of SBI's active education loan as NPA to Reliance Assets Reconstruction Company (RARC) – Regarding- Urgent need to regulate student friendly policies. This mail is in correspondence to recent incidents as regards education loans and the most insensitive practice of banks that sell active education loans as NPA’s to Assets Reconstruction Companies. You might be aware of a recent episode where SBI (State Bank of India) was reported to have sold its active education loan as NPA to Reliance Assets Reconstruction Company (RARC). This is highly condemnable and a matter of serious concern. It is indeed disheartening to note that many banks do not follow the RBI (Reserve Bank of India) and IBA (Indian Banks’ Association) guidelines in fixing the repayment schedule for student education loans to commence one year after completion of the course. The current guidelines also stipulate a 15-year period with telescopic repayment installment as schedule. However, most banks fix a higher amount of EMI (Equated Monthly Installment) within a short repayment period. This results in students being burdened during their initial career days to pay a huge sum as repayment. It also forces most of the students to default in their repaying their loans. Misusing this, after three months of default, the banks immediately classify the loan as Non Performing Asset (NPA) and attract high interest as penalty. They also sell these loans to Asset Reconstruction Companies. I would like to highlight a recently reported incident of an active education loan of State Bank of India sold as NPA to Reliance Assets Reconstruction Company (RARC), even while the student borrower was still pursuing his education. When the student approached the bank for the next disbursement of fees, the bank then realised that they had sold the loan account already to RARC. There have been several such complaints against State Bank of India and other banks about their insensitivity towards young student-borrowers. A particular student from Madurai district in Tamil Nadu has reportedly committed suicide due to harassment by a private recovery agency. In yet another instance, it was noted that the Central Bank of India shamed a poor education loan woman borrower for a meager default by displaying her name on a banner at a public place. The woman then lodged a complaint against the bank resulting in the National Human Rights Commission (NHRC) levying a penalty of one lakh rupees on the Bank. These are just a representation that have been reported, while there are many cases where education loan borrowers have been harassed by banks and have ended their lives. Of late there has been a rise in such incidents across the country. It is highly unfortunate that the banks do not seem to follow any norm in fixing guidelines to recover their loans, but resort to harass common man in ways that put them to shame. The education loan scheme was designed to help deserving poor students to pursue higher education. It was created to encourage students aiming to study further and specialize in fields suited to them. Recent study reports suggest that as on date only around 26 lakh (2.6 million) accounts with outstanding balance of Rs.60 thousand crore (600 billion) are the beneficiaries under the education loan scheme. This is less than even 1% of the total bank credit. That being the case, the reason that banks put forth to the people that they are currently suffering due to heavy defaults and NPAs under Education Loans is a farcical statement. In reality, assuming the worst NPA level at 5-8%, the total NPA under the education loan segment may not exceed 3000-5000 crore (30-50 billion). The gross NPA of the banking industry is estimated at 8.50 lakh crore (8.5 trillion) and the top 100 NPA accounts in all the banks reported to be contributing around 25 to 30% of their total NPA. While this is the factual position, banks are creating a misconception about the impact of education loans on their functionality. The Government of India provides only a partial subsidy during the moratorium period (study period plus one year) as against the stipulated 100% interest subsidy. In many cases, the eligible students do not receive the interest subsidy due to the fault of the banks. Banks load the unpaid interest subsidy on to the student’s account and treat it as NPA. In other words, the unpaid subsidy due from the Government of India is reflected in the NPA account dues liable for payment by the student. Thus the banks due to the miss-management of the education loan portfolio create NPA artificially. As Prime Minister of the world’s fastest growing economy that is home to millions of young generation who are currently educating themselves to take on the rest of the world, I humbly request you to take serious cognizance of this issue and ensure that the Government issues an order to the banks to not hand over these loans to Assets Reconstruction Companies. While the Government under your able leadership on one hand propagates ‘Make in India’, ‘Start up India’ and ‘Skill India’ programs to encourage entrepreunership and ‘Mudra Loans’ and ‘Incubation’ to guide and develop small and medium size businesses, such discrepancies and insensitivities in the banking sector are proving to be highly discouraging of the Governments efforts.